How I found it? : I think I ran across it ages ago on a bestsellers list and then put in a request for it on the public library's hold system. But that was months ago and I can't really remember. What's it about? : A left-leaning writer examines various anti-consumerist ways of living and attempts to go a year without buying anything except the necessities. She has trouble balancing her high-brow way of life with not buying anything and the book is peppered with her questioning whether wine or symphony tickets are a necessity. Did I like it? : I thought I would really like this book and was on a waiting list to get it from the library for months. I really didn't like it though. I skimmed parts of it and couldn't wait for it to be over. Levine alternates between giving details about her personal struggles with consumerism and journalistic sections detailing various anti-consumerist movements and theories. I understand that it would be hard to go a year without buying anything but the necessities, especially for someone who has a comfortable lifestyle like Levine, but it really seemed to me that Levine went at it in half-assed manner and didn't really come to terms with the reasons why she felt she needed to shop. I felt that she was preaching at me about the potential evils of consumerism while barely managing to practice what she preaches. Will you like it? : I wouldn't recommend this book. While it is a tale of personal struggle, and I'm sure all of us struggle with our consumer choices at some point, I don't find Levine's particular struggle to be that compelling and I doubt you will either. But don't take my word for it: A mixed bag of reader reviews on Amazon.com, and a review from Christian Science Monitor. The Basics: Hitching Rides with Buddha: Travels in Search of Japan, Will Ferguson, 2006, 410 pages, paperback. How I found it: This book has just been released as a paperback and I ran across it in the new non-fiction section of Chapters while debating how to spend my giftcard. I had read several of Will Ferguson's books including Beauty Tips from Moosejaw and How to Be Canadian (written with his brother Ian) and quite enjoyed them. What's it about? : Ferguson writes about a trip taken when he was a young English teacher in Japan. His goal is to be the first person to hitchhike the length of Japan and his plan calls for him to follow the "sakura zensen", the advancing front of cherry blossoms that hits Japan every spring. Along the way he meets a varied cast of Japanese characters and of course, discovers a little about himself. Did I like it? : How could I not? I love Will Ferguson, I love Japan and I love travel stories. Even without those factors, this book was actually laugh-out-loud funny at times. Ferguson provides great insight into the Japanese mindset and visits some sites off the beaten tourist track. Ferguson also has great insight into what it means to be a "gaijin" (foreigner) in Japan. Will you like it? : Even those not interested in Will Ferguson, Japan, or travel stories will enjoy this book. It is quite humorous and often quite insightful. It is also a quick read with a chronological plot. But don't take my word for it: editorial reviews from Amazon.ca, a review of the abridged British version (from 2000) from the Guardian, a great review from the blog Postcards from the Mothership. The Basics: David Suzuki: The Autobiography, David Suzuki, 2006, 405 pages. How I found it: I really don't remember. I think I wanted to read it because it was on the non-fiction bestsellers list and I have always been a fan of David Suzuki's work. What's it about? : Suzuki has already published one autobiography, called Metamorphosis, in 1987, so this one focuses mostly on his life and accomplishments since then, although it does give a brief background on his younger years. This book mostly tells the story of Suzuki's life, but he does get off on tangents about environmental issues, nuclear war, politics, and lots more. Did I like it? : I did really enjoy this book since I didn't know too much about Suzuki besides the work he has done with his environmental foundation. My only complaints are the length of the book, which makes it seem to drag near the end and the lack of organization in the book. The book is organized in a semi-chronological manner, but sometimes it jumps into being thematically organized, which gets confusing. Will you like it? : If you are a fan of David Suzuki, it is a good read. Otherwise, I don't know if I would recommend it. Instead I would recommend that you watch The Nature of Things on CBC or check out the David Suzuki Foundation website. But don't take my word for it: A review from the London Free Press, and another from the New Zealand Listener (a kiwi magazine). I recently heard about LibraryThing.com, a site that lets you catalogue your books, tag them, organize them, and compare them to what others have. If you are crazy about books the way I am, this is an awesome online tool. I have taken the liberty of creating a profile on Library Thing to keep track of the books I read here. It can be found under the user name: ireadtoomuch. As you may know, I don't actually own all of the books I review here - many of them come from the public library, etc. so they aren't technically part of my library. However, they are part of the library in my head, so I thought I would put them up there. Enjoy, and maybe send me your library thing profile as well? How I Found it: I can't remember. Perhaps it was one of the books that Amazon recommended to me? What's it about? : The book begins with a section on the history of "hustlers" in the New York borough of Queens. It begins with the organized gangs of cocaine dealers in the 70s and continues through to the crack heyday of the 80s. The second half of the book explains the history of hip hop in Queens, starting with Run-DMC and culminating with the rise of Irv "Gotti" Lorenzo's label Murder Inc. 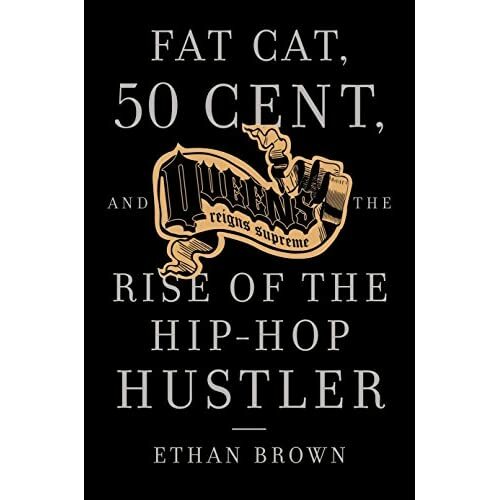 This section of the book also details how the hustlers are connected to hip hop and explains how some of the gangsters even funded hip hop artists to use as money laundering schemes. Did I like it? : I thought this book would be interesting as I wanted to know the history behind the boasts of many hip hop stars. Instead it was the same old same old glorification of violence and the lifestyle of the hustler. This is Brown's first book and it shows. He attempts to take a journalistic tone, but fails as he is obviously drawn in by his admiration for the lifestyle. The book also suffered from bad grammar and some very obvious editing mistakes. I was quite disappointed in it. Will you like it? : You would have to be a big hip hop fan, and a fan of the acts discussed in the book to find it interesting. As a biography of Run-DMC, Jam Master Jay, Ja Rule, 50 Cent, and Irv Lorenzo, it's not bad, if a little brief. As anything else, it's not a great book. Not recommended. But don't take my word for it: Editorial reviews from Amazon.ca, reader reviews from Amazon.com (because no one in Canada has reviewed it), a review from popmatters.com, and a review from someone's blog. I read a lot of things about a lot of things. I really don't discriminate. After I read something, I'll tell you about it. I'll also tell you if you should read it. Maybe you can also tell me what I should read?